Among the wide variety of cereals especially popular is barley but not everyone knows, what it's like and therefore treat it with a hint of disdain. 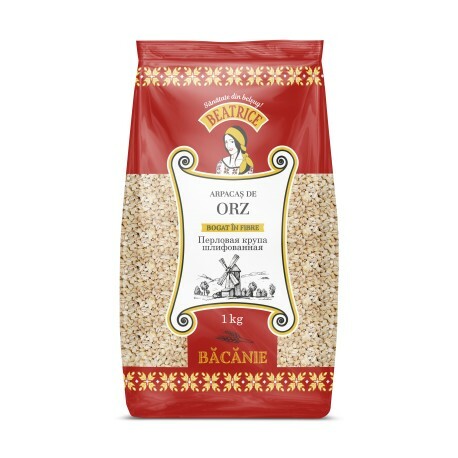 Ordinary barley is the cereal of integral barley from which only removed the shell; "Dutch" is also from cereal integral grain which hold a strong and deep processing; barley grits - in fact it is an ordinary barley, just shredded. Barley is used to make not only crumbly porridge, and soups. Porridge contains a lot of amino acids (for example, lysine), and trace elements. Lysine promotes formation of collagen - the substance from which depens condition of the skin and suspended the general aging of the body. Due to the lysine you can save for a long time heart health and prevent colds. Among the useful trace elements: iodine, calcium, zinc, potassium, manganese, chromium, selenium, iron and many others. Porridge is rich in vitamins B - B6, B9 and A, PP, D and E.
Vitamin A helps to improve vision, enhance immunity; it determines the condition of hair, skin and teeth. Vitamin PP is required for normal functioning of the nervous system; It helps to reduce "bad" cholesterol. Vitamin D is involved in the formation of teeth and bones. Vitamin E - is an antioxidant which helps to stimulate circulation. Vitamins from B group helps the formation of hemoglobin in the blood; required for exchange of amino acids and proteins; give the body energy. Pearl barley decoction can cure diseases of the digestive system, because it has a enveloping and soothing effect. The decoction is useful in diseases of the genitourinary system, liver and gall bladder. This decoction even inhibits the growth of malignant tumors in oncology. A good result shows the using of pearl-barley broth as a diuretic, expectorant, He also has a tonic properties and is able to increase the production of breast milk. Even water may be used, which soaked with pearl barley because it remains gordetsin. This substance possesses antibiotic properties. Water may be used in treatment of fungal skin diseases. Well boiled barley porridge is recommended for patients with acute gastric ulcer and 12 duodenal ulcer, pancreatitis and chronic colitis. i.e improved purgation and other nutrients will not allow to linger body fat.